A new leader weighed in for the Dynamos division. The Go-Getters stayed the same at the top, but by a very skinny margin. That shows that pounds aren’t the only thing falling away in the 2019 Tribune Chronicle / Mercy Health Fitness Challenge community weight loss competition to benefit charity. A number of teams are jiggling up and down the standings as the going grows tougher. With three of the eight weeks of the contest gone like the chocolate cake at an all-you-can-eat dessert buffet, the 120 players on the 24 Fitness Challenge teams have combined to lose 1,163.25 pounds. That’s 4.26 percent of our starting vastness vanished. But unlike that exhilarating first week when the nearly 655 pounds melted away like magic, the teams shed only a combined 215 pounds in Week 3. There’s plenty of time for any team in either of our two divisions to make their move to the top and win the big money for the nonprofit groups of their choice. Last week, the Big Dogs nipped past Mission Slimpossible to take over first place, 5.5 percent to 5.4 percent. This week, the Slimpossible crew bit back, but remain just a tail wag off the pace. 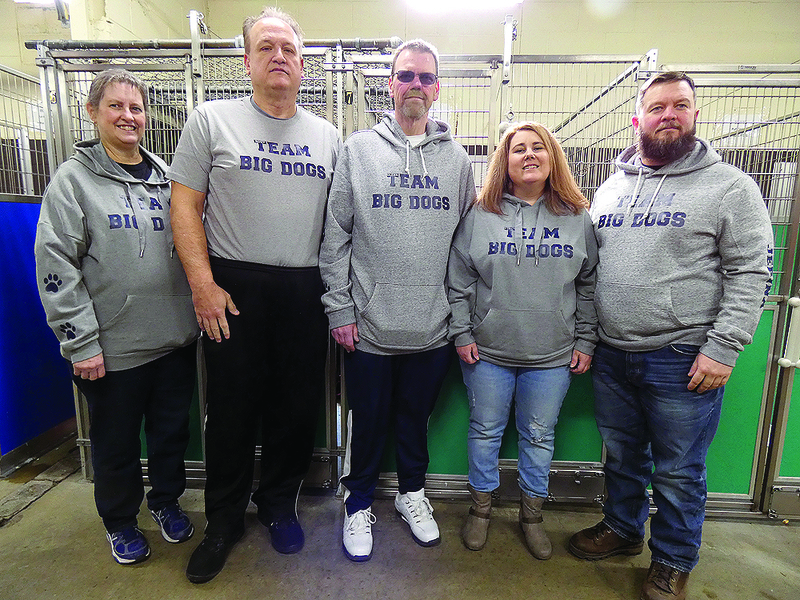 After three weeks, the Big Dogs have shed 6.77 percent of their starting weight, and Mission Slimpossible, 6.73 percent. “We were so close this week,” Slimpossible captain Cait Gilger said. “We’ll have to step up our game. Definitely more exercise this week. The rest of the pack sure is coming on. The Blubber Busters now are 5.06 percent smaller than when they started out, and three teams are in the 4 percent range. The gap is closing with more than half of the contest to go. In the veterans division, returning 2018 Fitness Challenge champions Just Weight appeared ready to repeat. Instead, The Slimsons jumped all the way from third to first place in the Dynamo division. After three weeks, it’s The Slimsons at 8.35 percent of starting weight lost, Just Weight at 8.15 percent, and Thinning the Herd dropping from second to third at 7.24 percent. Just Weight captain Jim Miller said there’s no panic setting in. He stopped short of predicting Weight’s rising back to the top. The team with best single-week performance each week earns a bonus $10 for their designated charities. The caveat is that all five members must weigh in at both ends of the week — no laying back for a couple of weeks, then showing up with a three-week loss disguised as one. This week, the teams of the week are the Blubber Busters for the Go-Getters, with 1.67 percent lost in the past week, and Just Weight for the Dynamos, with a single-week 1.75 percent performance. Three weeks ago, four of the 24 Fitness Challenge teams weighed less than a combined 1,000 pounds — God’s Busy Bees, 848.25 pounds (now 839.75 pounds); Because We Can 1, 947 pounds (909.5); Just Weight, 950.25 (872.75); and LOSTinspanx, 963.75 pounds (923.75 pounds). After three weeks, it’s six teams, with a seventh 14 pounds away from dropping below the half-ton mark. Trumbull Family Fitness 2 shrunk from 1,004.5 to 987.75 pounds, and the PsyCare Hungry Gamers dropped from 1,005.5 to 972.25 pounds. The Commish appear to be the next team destined to drop below 1,000 pounds at 1,013.75. Each week, we tip our napkins to one of the Fitness Challenge beneficiaries. This week, the spotlight turns onto Voices of the Trumbull Pound Dogs, the group designated by (who else?) the Big Dogs. “What we do is work directly with the (county dog) warden,” McClellan said. “We’re volunteers to help the Trumbull Pound dogs. … the volunteers that help walk the dogs and do all that stuff. “We raise money for spay and neuter, for medical needs,” he said. “If the dog is having trouble in its home, we provide funding for evaluation and training. Anything that we can do to help the dogs find homes and keep the homes. “Once they’re in a home, we support them. If they come up with heartworm, we pay for their medication. We encourage people to stay connected to the pound,” McClellan said. This week, Mike Rossi explains his team’s name, Four-and-a-Half Full-Grown Men. The reasoning is simple — “the relative size of its members,” Rossi said. The team was born with four decently sized guys and one lightweight little brother, so to speak. But they all contribute by becoming less grown men.